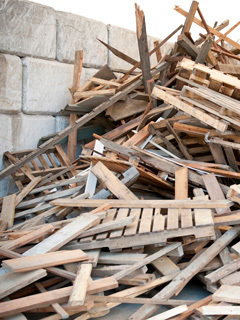 Building-related construction and demolition waste totals approximately 170 million tons per year, roughly two-thirds of all non-industrial solid waste generation in the U.S.
Total annual construction and demolition waste (“C&D waste” in the biz) equates to 3.2 pounds of building-related materials per person in the U.S., per day. According to the U.S. Environmental Protection Agency, 52 percent of this ends up in a landfill. Sources of building-related C&D debris in the waste stream include demolition (approximately 48 percent of the annual waste stream), renovation (44 percent) and new construction (8 percent). It is economically viable to recycle the majority of this waste, as the cost to transport and dispose of C&D waste can be more than 2 percent of a project’s cost. There are two great options for Philadelphians who want to make sure their C&D waste gets recycled. Richard S. Burns (4300 Rising Sun Ave., 19140, Hours: Mon.-Fri., 6 a.m.-5 p.m.; Sat., 7 a.m-3 p.m.) is open to the public and charges $80/ton (with a $40 minimum) to recycle your C&D waste. This is a good option if you’re not expecting to generate a lot of waste from your project, and you have a way to get that waste to the recycling facility. If you do anticipate generating a lot of waste from the project, Burns will drop off and pick up a Dumpster (for a fee). Visit burnscompany.net for a comprehensive list of the kinds of waste they accept. The other option is Revolution Recovery. (7333 Milnor St., 19136, hours: Mon.-Fri., 6:30 a.m.-6 p.m. and Sat,. 7 a.m.-1 p.m.) All materials are sorted, graded and processed on-site before being sent for recycling. Visit revolutionrecovery.com for a comprehensive list of materials they do and do not accept, and you can call 215-333-6505 for drop-off fees, or to get a Dumpster for your project. If you’re going to hire a contractor, ask for a written waste management plan for responsible disposal. If the contractor is getting a Dumpster for the project, ask who it’s from, and verify that they’ll recycle the materials. Support the C&D waste recycling industry by asking your builder to use new building materials with recycled C&D waste content. If you anticipate needing a Dumpster, remember that you must get a permit to have it placed on the street outside your house. It’s called an “Equipment Placement Application,” and you can obtain one through the Streets Department (phila.gov/streets). Have a Recycling Challenge or a tip for us? Send an email to letters@gridphilly.com.